what is called 'man' today. which produced all that is and once dead, will go back again. complete with soul and flesh. to walk and commune with the earth, and sea and land. is that I am so much a part of You. And though far away I've sometimes felt I know You never left. from one of which I am so much a part. Without you, oh most Holy God, I know I cannot last. one more step, takes me directly to my God in heaven. Finally! I am closer to Your reasoning behind my existence. It was not a mistake it was what You pur-posed. and accept that I am more like You and begin to live as you planned me to. so will the trees and grass and cattle and the house of clay once formed. For I glory that my spirit man will at last return unto thee. Well, I dropped my daughter off at the airport this morning and it was drama all morning. From the time she woke up until…well, she’s still waiting at her connection at LAX, on her way to visit her brother and sister-in-law in Hawaii whom she hasn’t seen for two years. Well it all started when I woke up this morning to make sure she was up and ready to go. But she abruptly informed me she had inaccurately given me the departure time for her flight and that she had an additional hour that she was going to use to catch up on her sleep; and dropped her head back on her pillow and fell back to sleep. Well she’d told me that her plan was that we’d leave for the airport by 7:00 a.m., so a few minutes later (5 seemingly to her) I knocked on her door and reminded her of the time. When she finally jumped out of the bed wondering where she was and what day it was, she slowly pulled herself together and began completing her packing and preparing herself to leave. And while she was “getting it together”, I took a few more minutes walking the floor, praying and thanking the Lord for protection, covering and her safe travel. Well, after rushing the old folks & the dog into the car, I’m reluctant to say, the trip to the airport was a wild ride, because she was of course, running late now, and she was driving to ensure she reached her destination on time! I reminded her that whenever she’s running late, she should ‘shave time’ in the house, not on the road. And she reminded me, the people on the street were the problem. Oh, yeah, she wasn’t Ms Holy today. She was operating under pressure; the perfect conditions for satan to use to his discretion. Today she was operating in her carnal self. So I thought it might be a good time (as she was entering into the airport terminal) to give her the word that the Lord had placed in my spirit for her today. So, as my stomach was settling from the ride, I said to her, “But let patience have [her] perfect work, that ye may be perfect and entire, wanting nothing.” So you don’t have to search it out, that’s James 1:4. I dared not say she needed to pray for patience, because God knows I don’t want to have to pray through tribulation, for sure. (Romans 5:3) So I was careful how I gave that word to her, letting her know that though it was obvious that she had “need of patience”, God revealed to me that she needed to learn how to allow “patience” to operate “in perfection” within her spirit man (so that she could do as the poem I wrote so long ago, “THE NOW OF LIFE” says) to help her get through. So when she got out of the car and abruptly said goodbye to her mother and her little doggie, Sasha; I glanced at my husband carrying her luggage to the outside baggage handlers, then bringing it back to car. And in my amazement, I asked, “what’s wrong”? She replied, “stupid people” it’s not American Airlines, it’s American Eagle”. Again my spirit repeated, “Let patience have her perfect work”, for there is a reason beyond what you can see with the eye. Well, it seems by the time we turned around and retraced our steps to arrive at the American Eagle terminal, they were calling her name to board. However, she hadn’t even gotten her ticket yet or gone through Security. So she was “denied” and that plane left without her. She was placed on ‘standby’ for the next departure and given another ticket. It seemed when she phoned me as I waited around the airport terminal; she would have to stay and wait to see if she could board the potential flight on which she had been placed on ‘standby’. But the good thing was that there was a flight leaving every hour for LAX so she had a lot of time to ‘get it together’ before time to panic over the connecting flight in Los Angeles. So by the time I arrived home, and she was there waiting, we talked on our cells for a while, and laughed at all that had transpired; adding to the drama, the fact that she'd had a ‘full body scan’ as she went through security. She laughed and said, she dared not leave and try to come back in because they were giving her ‘that look’ that implied, ‘don’t you go out of our view’. Needless to say, my daughter was having some kinda morning. So while we were having fun chatting, I told her to look around and see what it was that God needed her to see. That there is a new level that God is taking her on and He is requiring her to be more ‘responsible’ for her decision making and her actions. And I was not just talking about this airport incident. I was talking about her life. That it was time for her to pay attention in this moment and see what God was doing, to listen to ‘wise counsel’ from her Elder and refocus. In speaking about this with my husband earlier, I told him that God could not allow her to board that plane because she was not in right standing. Any time any of us take a trip, we are usually quite prayerful, remembering always to stand together in our home and we pray for the ones that are leaving as well as the ones that are staying. We pray 'til we meet again', may God watch between me and thee. We thank Him for his covering and much, much more. But this day, my daughter rushed out without even a “thank you Lord” as we shut the door behind us. It was ALL wrong. But because the prayers of the righteous availeth much, God had honored my prayers which caused Him to delay time to allow her the opportunity to ‘be still’, take a breath and refocus on Him as she so knew to do. Every once in a while we have to take a moment to check ourselves; whether we are in rightstanding with the Father, or have been ignoring His prompts and hints to look at Him or to listen to His still small voice; from His mouth directly in our ear or from the mouth of wisdom. I gave a lesson on our “Live Prayer Call” event recently where in this teleconference (www.talkshoe.com/tc/89323) the current series is “Hindrances to Prayer”; well, a few weeks ago, the lesson was focused on the hindrance, “Impatience”. And though I know I must have used James 1:4; I know for sure, God did not lead me at that time in the direction of “her perfect work”. However, I digress. ‘Her perfect work’…her perfect work. I have been fasting and praying these past few days. I love how easy it is for the Lord to stir me up with the little things while I am on a Fast! Glory to God! It’s amazing! So, as I was talking with my husband, I said to him how ‘her perfect work’ (patience) operates perfectly in ‘the NOW of Life”. 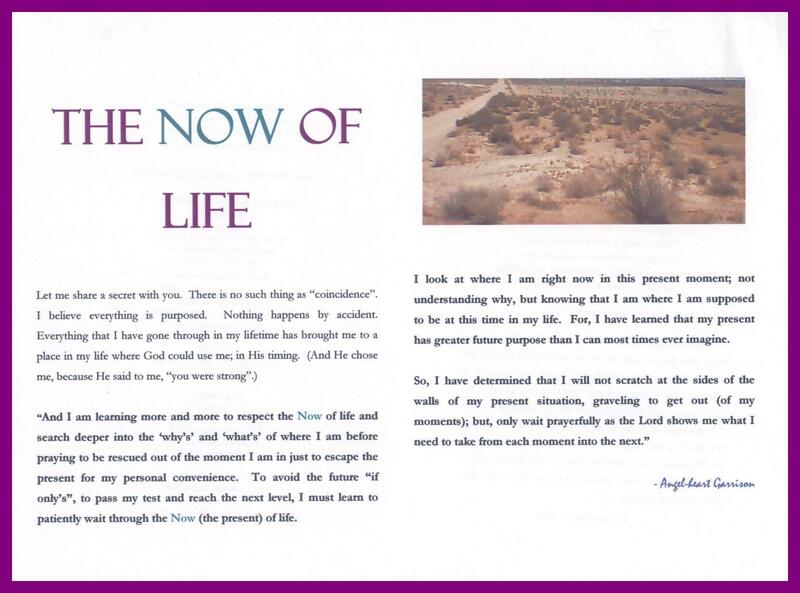 I continued and explained that the Now of life is about where you are right now in your “present”. Sometimes we can find ourselves in predicaments that we caused upon ourselves and/or just look up and we’re in them. But when we allow ourselves to take that inward focus, take that deep breath and stop scratching on the sides of the walls trying to get out of the situation or predicament and just turn around, look around with our spiritual eye and see what it is that God wants us to see in that place; then, before we know it, we will be moving forward to the next level. After we have done what is needed where we are, God will move us to the next place that He has Planned in our Purpose. As you recall, I had begun my prayers for my daughters’ safe travel the night prior and when I woke up this morning continued to praise and thank the Lord for keeping her, for her angels that He has positioned and charged to watch over her. I thanked and praised Him for her safe travel. Well my words ‘went before her’ on this day. And God would not allow my daughter to board a plane in the wrong attitude. He has His own way of holding time so that we may operate in His moments. So once again, as I stated before, He gave her opportunity to choose to take this moment to ‘be still’ until she saw in His mercy and grace, what He needed her to see and do before He could allow her to safely move from the ground to the airways. You may not understand prayer the way that I do. But all prayer is not the same. Prayer that goes forth (before) creates an atmosphere of its’ own to ensure that the blessings of the Lord can be rained down upon His people. Yes we daily cover ourselves with the blood of Jesus, and put on our Armor, but we are required to get our hearts right before the Lord. We are required, before entering into the Holy Place to look into the mirror of the Word (James 1:22-25 tells us to wash with the water of the Word) and make sure we are in “right standing” before stepping out on that battlefield, called life. And God, because He loves us and is merciful and full or grace, will intentionally cause “delay” to take place on our path to ensure His word can operate on our behalf and not against us. For God’s word works both ways. Deuteronomy 28 tells us that, without a doubt. So, though my daughter may have had a rough start this morning, when she took time to “be still”, her day moved forward in God’s Plan for her purpose. She boarded the next flight to LAX and arrived safely. She’ll sit there a few more hours and see the things that God has planned in her purpose for those around her where she is presently. If this is what it took for Him to get His place back with her, get her attention focused back on Him; then so be it. Praise the Lord! This delay hurt nothing. In fact, this delay, changed the atmosphere. In this delay, she has found an opportunity to see her cousin and the children she loves so much as she awaits to board the next flight out of Los Angeles. God met a desire of her heart that she had not prepared for today. That's how God loves. And not only will she be met at the airport by her sister-in-law, but her brother, who would have been working had she arrived ‘on time’, will be standing there to greet her face to face. And that was God’s Plan in their purpose because I know how much my son and daughter love one another and have missed one another these past 2 years. During that time, there have been life threatening situations, job losses, financial crisis, major medical situations, earthquakes, tsunamis and losses of life that have effected our family dearly. And God is allowing them to meet face to face and share feelings and thoughts they’ve held for this God Purposed moment. I love the Lord so much. He is a seamstress; for He knows how to mend the most intricate details of our lives with His own hands. I love the Lord. He is Merciful. He is Truth. He is Freedom. What is God’s Plan in your purpose? Does it seem that you are in a holding path and are anxious to ‘get out’ however you can? Just ‘be still’ and look around; and begin to look through the eyes of God at what it is that He wants you to see in this place that you are in. Can the atmosphere around you change because of someone else? Is there someone that may need to hear, “Jesus loves you”, in this place that you’re selfishly scratching at the sides of the wall to get out of? Is there someone who needs a helping hand in the place where you are right now? Stop for a moment and just look. That’s patience having her perfect work; where the Fruit of the Spirit (love, joy, peace, longsuffering, gentleness, goodness, faith, Meekness, & temperance) (Galatians 5:22-23) is operating in you at it’s Most Highest capacity. Don't be like Peter and look at the storm (your predicament, situation, circumstance you have found yourself in), focus on Jesus ahead of you. See God's Plan in your purpose through Jesus. Everyone is not in this world to reach the same goal, attain the greatest heights. Some of are here to just help someone else run in this race; to be encouragement for the soul; to give meat to the one who needs to hear “thus saith the Lord”. ‘Wait’, ‘be still’, and look…live present in the NOW OF LIFE.